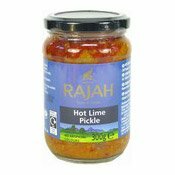 Use as a relish accompaniment with entrees, curries, meats, cheese and poppadums. Once opened keep in a cool and dry place and consume within 3 months. Ingredients: Limes (68%), Sunflower Oil, Salt, Chilli Powder (2.5%), Acid (Acetic Acid), Mustard, Fenugreek, Turmeric, Asafoetida. Simply enter your details below and we will send you an e-mail when “Hot Lime Pickle (酸辣檸醬)” is back in stock!